Coffee With D is a comedy movie that was not promoted much before its release. The movie features Sunil Grover, Zakir Hussain, Dipaannita Sharma, Anjana Sukhani and Rajesh Sharma in main roles. The movie, which marks the directorial debut of Vishal Mishra, who has also written the story, has been released in theaters on 20th Jan 2017. Sunil Grover plays the role of a former journalist, whose character is somewhat similar to Arnab Goswami, and is even shares his name. However, he is about to lose his job, and struggles to maintain his expensive lifestyle and the proper care of his pregnant wife, with little success. Then, his wife comes up with the idea of conducting a video interview with the most dangerous Don and Arnab considers it to be a sure shot way of winning back his job and his sense of security. He even makes an announcement about the same. As he along with his team consisting of Neha, Rummy, Roy and Chussi sets out to performing the daring task, it remains to be seen whether they attain success in the same or not. 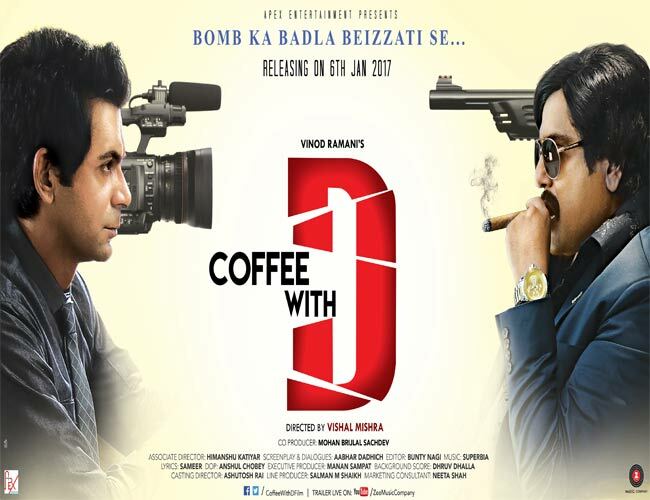 Coffee With D is a lighthearted comedy movie that aims to provide wholesome entertainment. Vishal Mishra has managed to create a laughter riot based on a subject that most people choose to use a theme for serious crime thrillers or movies that are intended to send out a message. The star cast has portrayed the various characters convincingly well and their perfect comic timing has enhanced the humor level even more. Overall, Coffee With D is a good entertainer that proves to be extremely fun filled and IndiaCafe24 gives it a rating of 3.5.